Difference between revisions of "Ohio River Flood of 1937"
One of the jobs of the newly created U.S. Army Corps of Engineers was to design and construct better flood control measures for the Ohio River. These efforts have reduced the effect of smaller floods, but major floods can still create catastrophic results. In Point Pleasant, Ulysses S. Grant's birthplace was nearly submerged by flood waters on January 26, 1937. 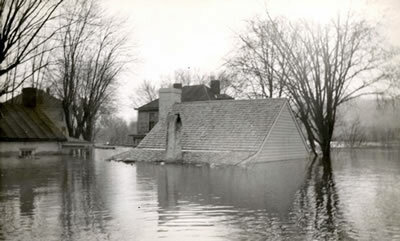 In 1937, southern Ohio faced one of the worst floods in its history. The flood was particularly difficult for the city of Cincinnati, where flood levels reached almost eighty feet. Communities along the Ohio River in Kentucky, Indiana, and Illinois also faced serious problems. As the flood waters rose, gas tanks exploded and oil fires erupted on the river. Parts of Cincinnati remained under water for nineteen days, and electricity and fresh water were in short supply. Many people lost their homes as a result of the flood. The Ohio River Flood of 1937 caused more than twenty million dollars in damages.